This week, graduate employees from the University of Wisconsin and Michigan State University occupied buildings to declare fees imposed on them by their employer as a form of wage theft. 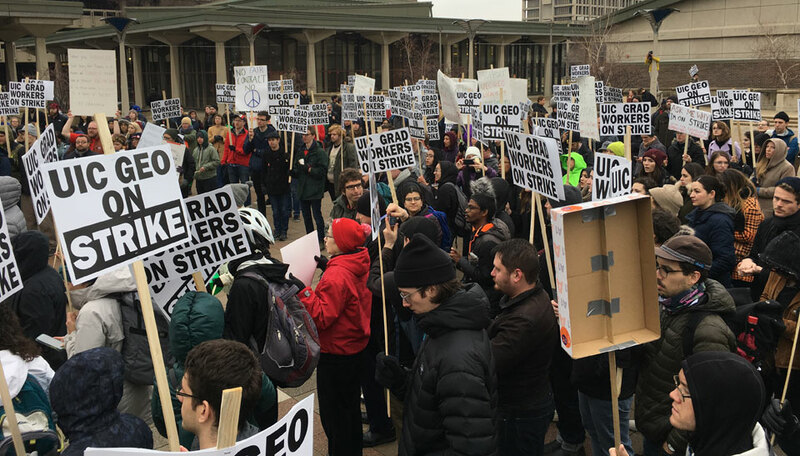 These occupations coincide with the third week of an ongoing strike at the University of Illinois at Chicago (UIC) by the Graduate Employees’ Organization (GEO) over the same issue. You would be occupying buildings and going on strike too if you had to pay 10% of your salary back to your employer every year. In fact, members of the UIC GEO currently pay about $2,000 from their $18,000 salaries. Astoundingly, this is not yet interpreted by the Department of Labor as constituting wage theft. The good news is that the UIC GEO strike has so far reduced their fees and fixed compensation increases to more-than offset future fee increases. The UIC GEO achieved this by shutting down hundreds of classes, running an inclusive and democratic bargaining campaign, as well as organizing with UIC students and faculty. The bad news is that the UIC administration now wants to prevent graduate employees from making up lost hours which would result in docked pay. Many graduate employees live paycheck to paycheck, so needless to say their strike will continue until UIC completely reverses their position. In fact, UIC is hardly in a position to maintain their posture as they have had hundreds of classes cancelled, about as many classes worth of ungraded assignments, and there is an impending UIC United Faculty (UF) strike authorization vote on Monday. For those in Chicago, donate to the UIC GEO strike fund and show your support at the UIC GEO noon rally at the UIC East campus quad. You will be in good company as UIC undergraduate students will be staging a simultaneous walk out in solidarity with UIC GEO and UIC UF. After helping to finish this fight, you may find yourselves in the company of the University of Chicago Graduate Students United (UC GSU), who are in an ongoing fight to bargain their first contract. Lastly, for those out of town, look up a graduate employee local near you and also donate to the UIC GEO strike fund. 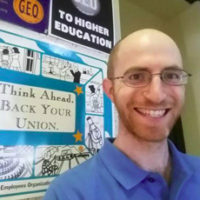 In the US, there are at least 33 recognized and 24 not-yet recognized graduate employee unions, with at least another 25 graduate employee unions in Canada. While the issues at each local may be different, they all share a common core value with the UIC GEO strike: higher education should be for everyone, not just the wealthy. Working on poverty, housing, labor, and machine learning. Aspires to include childcare, food, justice, healthcare, gender, inequality, and immigration.